Thomas, Janice; Mengel, Thomas: Preparing project managers to deal with complexity  Advanced project management education; in: International Journal of Project Management, Vol. 26 (2008), pp. 304-315. Hartman, Francis: ; in: International Journal of Project Management, Vol. 26 (2008), pp. 258-267. Complexity is a meme that just doesn’t want to die. 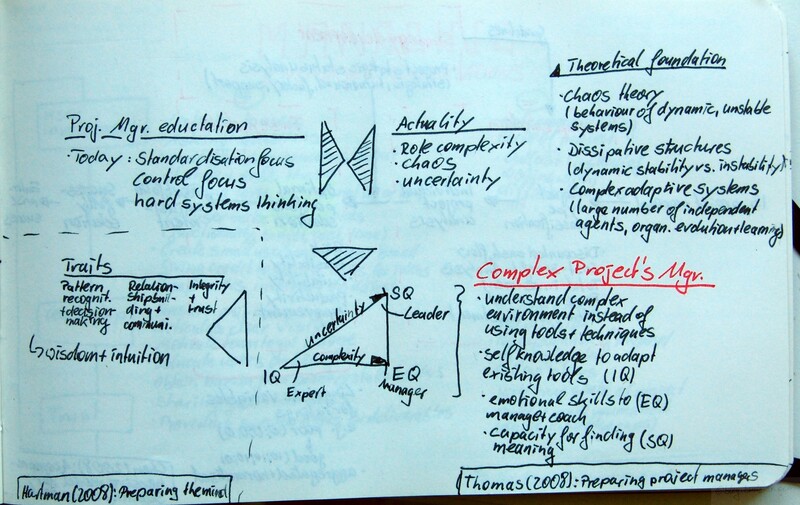 I wrote before about articles on the foundamentals of complexity theory and project management, about the use of autonomous cells in project organisations and how they prevent complex project systems from failing, and the complex dynamics of project entities in a programme. Not surprisingly this meme has spread into the coaching and project management education world where there is some money to make of it. Thomas & Mengel argue that the current project manager education is not suited at all to prepare for complex projects. The focus on standardisation, control, and hard systems thinking stands in direct opposition to the actuality of projects, which show high complexity in roles, high degrees of chaos and uncertainty. So what does it take to be a Complex Project’s Manager? In their framework Thomas & Mengel see most of today’s project managers as Experts, these are project managers heavy on the IQ side of their IQ-EQ-SQ-Triangle. The authors see two developmental strategies. One is coping with uncertainty by moving towards the sense-making SQ corner of the triangle and becoming a Leader. The other developmental direction is coping with complexity by strengthening the EQ corner and becoming a Manager. Gehring, Dean R.: Applying Traits Theory of Leadership to Project Management; in: IEEE Engineering Management Review, Vol. 35 (2007), No. 3, pp. 109ff. And also in: Project Managment Journal, Vol. 38 (2007), No. 1, pp. 44-54. I, personally, have mixed attitudes towards the whole Personality Traits Theory. While I still think there is some ground for the NEO-PI constructs and scale, I really do believe the whole Meyers-Briggs-Type-Indicator (MBTI) is total crap, especially using a magical sorting hat which uses binominal (E or I, S or N, T or F, J or P) values on dimensions, when the scale seems to be normally distributed. Furthermore there seems to be proof that the whole thing is situational. I am an eNFP by the way. However Gehring outlines the typically looked for leadership competencies of project managers in a very nice structured way (see my graphical summary). The author further describes the personality traits usually found with specific MBTI types. He then matches competencies to MBTI types. ENTJ, ENFJ, INTJ, ISTJ, and INFJ art the top 5 matches between competencies and personality types. Unfortunately the sample is rather small (53 respondents) and the article lacks any statistical information about the validity and quality of the results.